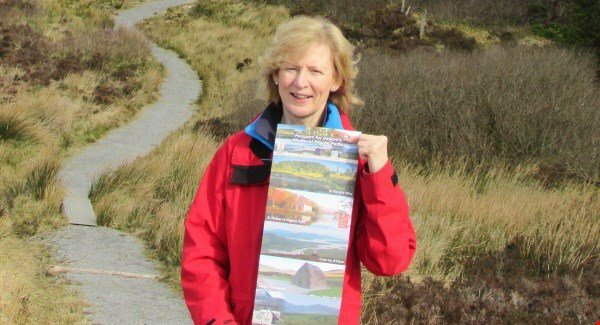 Carmel Needham, Mid-Tipp Hillwalkers, with her ‘Pilgrim Passport’. A new Easter festival envisages thousands of people retracing their ancestral christian heritage on Ireland’s ancient pilgrim paths. The country boasts a series of traditional holy trails throughout Munster, Connacht, and Leinster. From March 22-29 has been designated National Pilgrim Paths Weekend and during the Easter period, a series of events have been organised. A day-long pilgrim’s trail event, first held in 2014, has been extended into an inaugural week-long festival. The walks will take place on medieval penitential trails. Copies of a pilgrim passport for Ireland also will be available during Pilgrim Paths Week. The passport offers a unique opportunity to walk 120km of Ireland’s foremost medieval trails and receive a Teastas Oilithreachta (Certificate of Completion) from Ballintubber Abbey. Speaking about the launch of the new festival, chairman of Pilgrim Paths Ireland, John G O’Dwyer said: “Recent times have seen a remarkable renewal of interest in following the footsteps of pilgrims past. “In this context, National Pilgrim Paths Week was created to raise awareness and use of Ireland’s historic pilgrim routes. To find out more about the National Pilgrim Passport, go to www.pilgrimpath.ie; email info@pilgrimpath.ie. Read the full article in the Irish Examiner here.